I will start with basics of how a copy of windows gets automatically activated when installed on OEM (original equipment manufacturer) based PCs, traditionally when a copy of windows is installed you have insert your license key and activate by verifying it with Microsoft via internet or by getting a confirmation id over telephone. But with OEMs like Dell, Sony, Lenovo etc. a need was felt to get windows activated right upon installation without going through all the annoyance. With Windows XP a method called System-Locked Pre-installation (SLP) was devised. 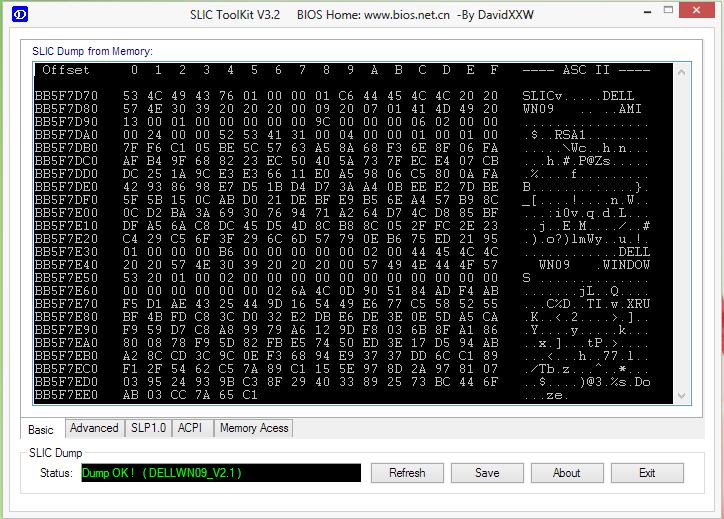 This method uses an area of BIOS to store some identification data, in SLP 1.0 the version included with XP, this was simply the name of the OEM. There are files on hard disk when windows is installed which were being matched with the value from BIOS for verification, if matched your copy gets activated. SLP 1.0 was cracked quite easily which demanded for a more complex system to be developed resulting in SLP 2.0 included with Windows Vista and SLP 2.1 shipped with Windows 7. Both methods works similarly with only a change in marker in Windows 7 based PCs. A SLP 2.1 involves checking the presence of a matching OEM-supplied key, an OEM-specific certificate and the most challenging part of the puzzle an OEM-specific ACPI_SLIC table (SLIC 2.1 table) before it can activate. Now moving to next step, OEM-key and OEM-specific certificates were being cracked very early when a copy was leaked illegally from Lenovo, but the real hack was to bypass the SLIC table. Methods were developed commonly known as Loaders (also called the softmod) which involves loading the SLIC table in memory before the main OS loads thereby fooling the system with a fake SLIC table. These methods involves Linux based loaders and sometimes may install trozens or other malware on your PC. Other method called the hardmod also exist which modifies the BIOS and may lead to complete system damage. We will now learn how to get your copy of windows 7 genuine without compromising the security and system itself. The first step is to check if your BIOS has a SLIC 2.1 table or not, and can be easily done using the SLIC_ToolKit can be downloaded using a google search. Run it and you will see the window indicating the presence of SLIC table 2.1 marked “Dump OK ! ( DELLWN09_V2.1 )”. hope you enjoyed the blog… !!! Is this works UEFI based motherboards? When I try to download from your Google Drive link, Google is telling me the SLIC file has a virus and can only be downloaded by the owner. SLIC 2.1. Can you provide a link? I am left unclear if there any record in the bios of the flavor of windows that is supposed to be installed? Can a thinkpad with vista be upgraded by this method to win7, for example? Also, I have Win 7 install media given gratis to university students. Will that media work to activate an install, or do I specifically need some kind of OEM disk? Alternatively, I have a number of old machines here, and I want to move hard drives and windows installs between them. Given a working system, can I just clone the disk (to a larger one, for example), install that to another machine, and then run this process? Also, and possibly alternatively, I do have Win 7 install media given gratis to university students. Will that media work to activate an install, or do I specifically need some kind of OEM disk? One more question, if you don’t mind. I’ve got a bunch of Thinkpad T6x’s all but one with the most updated bios. Oddly, those with the later bios are still slp 2.0 (LENOVOTP-7I), but the one that hasn’t been updated is slp 2.1 (LENOVOTC-90). Not sure how that happened, but could I just copy the 2.1 version of the slic table over the 2.0 version? Hi. Great guide first of all. Very thorough and informative. Here’s my situation. I had a Dell OEM Win 7 Home license. Now I want to use the same license on a new HP laptop. So, in the step where you have to install the SLP key for the manufacturer, should I load Dell or HP? Many thanks for these instructions, you saved the day. God bless you. You’re a rockstar, saved me from running a repair with a different iso and a long a$$ drive. Nice, is there any way to do this with Windows 8/10? Outstanding!!!!!! I’m quite certain I’ve searched at least 150+ sites…and never found this info, just turned licensing hell into easy street. Thank you!!!!!!!!! I have to express my gratitude for your generosity in support of people that should have help with this important issue. Your real commitment to getting the message around became rather advantageous and has consistently empowered regular people much like me to achieve their dreams. The informative tutorial means so much a person like me and even more to my office colleagues. Best wishes; from all of us. Almost all of whatever you point out happens to be astonishingly accurate and that makes me ponder the reason why I had not looked at this with this light before. Your article really did turn the light on for me as far as this particular issue goes. However there is just one factor I am not really too comfy with so whilst I try to reconcile that with the actual central idea of your position, let me see exactly what all the rest of the readers have to say.Very well done. I think the admin of this web site is really workinghard for his web page, foor the reason that here every material is quality based material. Guys who need window 7 key can go link http://cheapwin7activationkey.tumblr.com to got. My key got here and after i used is great works. Hope it help you. Hashes are verifiable against WHAT AUTHORITY? That’s right – NONE. I’d rather trust Microsoft, and that’s saying something. If one can do the OEM Activation via SLIC table in the BIOS, then one has already paid for the OS, so no need to trust dodgy loaders. Sorry for the substantial review, nonetheless I am particularly loving the new Zune, and assume this, as very well as the high quality evaluations some other us residents consist of written, will assist you choose if it really is the directly alternative for by yourself. This is starting to be a bit more subjective, nonetheless I much want the Zune Sector. The interface is vibrant, is made up of far more flair, and some amazing capabilities which includes ‘Mixview’ that enable on your own all of a sudden watch very similar albums, new music, or other people related toward what you are listening toward. Clicking on one of those will center on that product, and a different mounted of “neighbors” will occur into look at, allowing yourself towards navigate around studying by identical artists, audio, or consumers. Chatting of end users, the Zune “Social” is on top of that great exciting, enabling yourself track down some others with shared preferences and getting pals with them. Yourself then can listen in the direction of a playlist constructed based upon an amalgamation of what all your good friends are listening to, which is far too thrilling. People anxious with privateness will be relieved to comprehend your self can avoid the general public from watching your person listening habits if yourself so get. Amongst me and my spouse we’ve owned further MP3 gamers over the years than I can count, which includes Sansas, iRivers, iPods (classic & touch), the Ibiza Rhapsody, and many others. Still, the remaining couple yrs I’ve settled down in the direction of one line of players. Why? Mainly because I was happy to discover how well-designed and fun in direction of hire the underappreciated (and extensively mocked) Zunes are. “fun in direction of hire” – Try English. Zunes were unpopular because MS decided to bolt on some nasty DRM, as far as I understand it. That and not much space… 160GB on an ipod is still not enough for me to have the freedom of my whole mp3 collection to choose exactly what I want to hear (or what I want others to be introduced to). I don’t understand why we are running that program to look at the SLIC information unless you are saying that the 2.1 is necessary for this to work. And I don’t know what you mean by getting the OEM certificate and moving it to the C drive. How/where do I do that? I understand the rest of it, but it still says not genuine probably because I do not have the certificate part. Thanks. And when I run the first command I get a Windows Script Host box stating: On a computer running Microsoft Windows non-core edition, run ‘slui.exe0x2a0xBBA’ to display the error text. Error 0xBBA. Attempting to run that command gives me an error that it does not recognize that command. To Neil Chester. Just do a google search for Windows 7 Loader 2.6.2 By Daz, or older version. You should see several places to get it, but you need to only use one that has no malware, malware is everything, Trojan, Virus ECT. Make sure when you extract the RAR, you have either, Avira, Fsecure, Bit defender, or Kaspersky as an anti-virus. Windows- DAZ loader will not flag as a virus, but people take his work and infect it. Once you have a clean one, you can use it on any version of windows Vista or 7. The reason I say this is it sounds like they used a bad key or used this program, and you can’t just use a generic OEM key without the table being injected. You can try one other thing, do a clean install of the original OS, and try key, if it doesn’t work try my suggestion with the loader to TEST the laptop and then buy a key. Even though Microsoft will NEVER know it’s injected. I really love your writing style. You should be thanked more often. I discovered your website by chance You remind me of my girlfriend. This post definitely has all of the information and facts anyone could want. I’ve truly enjoyed browsing your blog posts. I truly feel your website needs a lot more attention. Ireally enjoyed every single minute reading this. I can tell that you do this because you really like doing it. Awesome writing and straight to the point. Just wanted to say fantastic blog! Incredibly helpful info. Reading your content is way better than kissing. I have used both of them and I really can’t make up my mind on which one I like the most. Thank you a lot for sharing your thoughts. I truly like your work a lot! ﻿How many people do you really think might possibly believe in this typeof thing? That sure is a brilliant way of thinking about it. I have recently showed this article with people I work with and people who see it seem to love it. I really appreciate this page. Extremely magnificent short article. This really solved my issue. I’m just blown away by the smart feedback on this site. My girlfriend told me they really like your posts post.